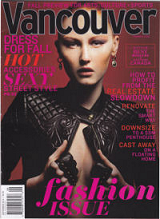 Eco Fashion Week in Vancouver is on now, April 9 to 14. You may know that I am all about the thrift and treasure hunt, so this event spotlighting the challenges of a creating a closed-loop, sustainable clothing industry is right up my alley. It features not only hugely popular runway shows of eco-conscious designers, but also includes public engagement in panel discussions about eco fashion. Tickets are still AVAILABLE for the runway shows at the Fairmont Waterfront Hotel on April 12, tickets here, and the Collective Conversation on April 13 at the Waterfall Building. The CC will be moderated by Erin Cebula of Entertainment Tonight Canada, and features panelists from Levi and Strauss and Value Village, as well as local designers. There will also be a special interview with John Fluevog. Check HERE for details and tickets. The Eco Fashion Week website has a complete rundown of what’s going on. It’s still not too late to join!